Branding Program Aims to Increase Exposure and Sales of Taste NY Products. Albany, NY - October 9, 2014 - Governor Andrew M. Cuomo today announced a Taste NY pilot marketing and branding program to maximize exposure for New York State wines, spirits and ciders at liquor stores across the state. Taste NY promotional materials identifying products as “Made in New York” are already on display in six liquor stores, and will soon be rolled out in dozens more from Long Island to Western New York. The Taste NY marketing and branding program for liquor stores is a result of Governor Cuomo’s second Wine, Beer, Spirits and Cider Summit, where industry feedback indicated that a more visible affiliation with New York would help maximize exposure and sales. 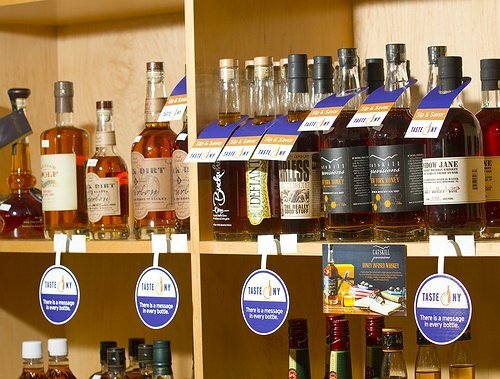 The program includes Taste NY signage to highlight New York wine and spirit brands on shelves and encourages store owners to build product displays highlighting the wide variety of New York brands. The New York State Department of Agriculture and Markets worked with the New York State Liquor Store Association to identify the pilot locations, and to roll out even more marketing displays and materials at two trade shows coming this month. On October 14, the New York State Liquor Store Association’s 5th Annual Tradeshow will take place from 2 to 8 p.m. at the Desmond Hotel and Conference Center in Albany. Taste NY materials just like the ones on display at the six pilot stores will be available for industry representatives interested in showcasing New York State products at their places of business. On October 16, staff from Taste NY will present a display at the Association’s Holiday Tradeshow in Rochester, which takes place from 2 to 8 p.m. at the Rochester Riverside Convention Center. Marketing materials will be available for participating liquor stores at the event. The Trade Show in Rochester will also feature nearly 90 wine, beer, spirits and cider companies sampling and promoting their craft beverages under the Taste NY banner for liquor store, restaurant and bar owners statewide. More information about Taste NY can found on Twitter, Facebook and www.taste.ny.gov. Subject: LongIsland.com - Your Name sent you Article details of "Governor Cuomo Announces Taste NY Displays Rolling Out at Liquor Stores Across the State"